Plenty of indoor options (airbnb, hostels & BnBs), and adequate number of spots to camp on the coastal sections. The most northerly trail of all the National Waymarked trails! With sunshine flooding the streets, and people lounging in the shade, we left Dungloe for the last time. We took a local link bus up to Falcarragh, where for most of the time we were the only passengers. The driver was incredibly friendly and jovial, pointed out all the local history and places of interest (including his own house). We arrived to Falcarragh, have coffee, and set off. We havenâ€™t really planned the day, just had a rough look at the maps when we were looking at where we could get a bus to. Falcarragh is the town at the top right hand corner of this almost square trail. From there itâ€™s a straight line down to Earagail, the most distinctive looking mountain Iâ€™ve ever seen, and Earagail Youth Hostel. From the general information online we knew that it was about a four day trail, so our end point for the day was the hostel. Errigal - the mountain itself - is 751 metres (2,464 ft) and is the tallest peak both of the Derryveagh Mountains and in County Donegal in general. Errigal is also the most southern, steepest and highest of the mountain chain known as the "Seven Sisters". The Seven Sisters includes Muckish, Crocknalaragagh, Aghla Beg, Ardloughnabrackbaddy, Aghla More, Mackoght and Errigal. Itâ€™s still the middle of a drought, so itâ€™s hot as we make our way south. The trail follows tiny backroads out of Falcarragh, and staying on these tiny lanes makes a very straight bee-line downwards. The landscape is beautiful despite the heat, and we spend as much time taking photos as we spend walking. However, the mountain is approaching us much faster than I expected, and by late afternoon weâ€™re making our way around Errigal and down into the small village around its base. Even though a quick glance at the map looks like this is roughly 25% of the trail, itâ€™s actually only around 15km. Much shorter than we planned, but weâ€™re not ones to pass up an easy day of walking! 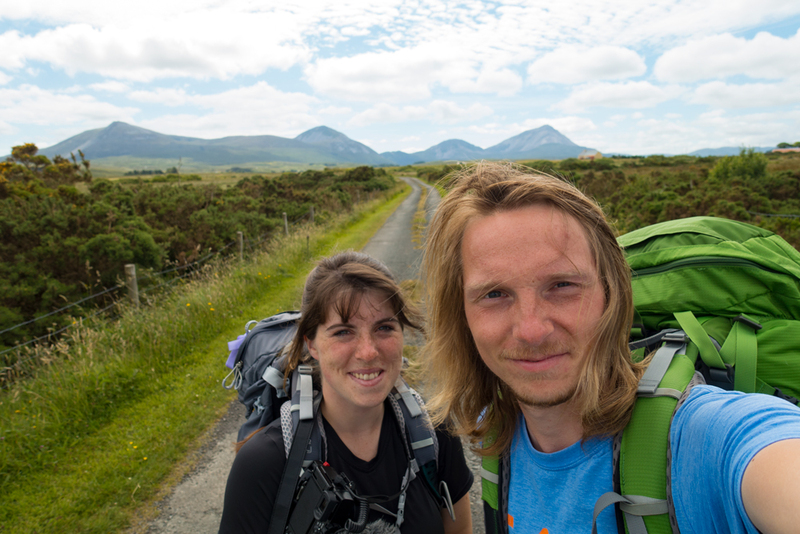 We check into the hostel, dropped our gear and basically chilled out. There hostel itself was recently purpose built, and has large windows and peaceful common areas. Errigal is well known for the pinkish glow of its quartzite in the setting sun, and as we sit eating our noodles on the picnic bench outside the hostel the mountain looks like a blazing fire or amber, pinks and oranges. We leave the hostel at a reasonable hour the next day walking through a light fog. The trail takes you down and across a lake towards Gweedore. Itâ€™s a nice walk along some forestry roads, nice and peaceful and easy to wake ourselves up along. We come across some old cottage ruins, which are beautiful. We wonder about why thereâ€™s always fuchsia bushes growing around these kinds cottages. Itâ€™s always nice, they bring so much colour to the place. Itâ€™s also becomes an easy way to spot where small old ruins are. The trail doesnâ€™t actually go through Gweedore, and we donâ€™t bother to make the detour. The rest of the afternoon is pretty much spent on tiny boreens. Weâ€™re quite tired as we arrive into Bunbeg. Thereâ€™s a tiny fancy cafe that we stop at and eat some delicious food. I think we sat there for a couple of hours, just enjoying not moving. Iâ€™m going to be perfectly honest - weâ€™d thought about skipping the next section of the trail since weâ€™d looked at the maps that morning. It was roughly a 10km loop out around the beaches between Bunbeg and Derrybeg. If we walked straight up the road it was only 1km. When we started moving again we walked down to the beach and immediately saw quite a few â€œno campingâ€� signs. We hadnâ€™t planned where we were going to stay that night, and Carl had a case of the camping jitters - itâ€™s not always easy to hunt for a spot to camp, then wait around to see if itâ€™s really as secluded as it seems, then wait until it starts to get dark before pitching up. After a few months on the road the uncertainty can become really mentally draining. So whenever one of us is having a bad case of the camping jitters we typically try and find hostels or campsites. What we found that night was an airbnb â€œglampingâ€� campsite. It was â‚¬40, so the same price as a hostel. We walked back up the trail into the small town and dropped off our bags. Not having the bags on our backs we were suddenly much more motivated to go out and walk that 10km loop around the beaches. It was such an incredibly beautiful evening that as we started walking it I knew it was going to be one of those nights that I knew I wouldnâ€™t forget. And then the bonfires started. Have you ever heard of St. Johnâ€™s Eve? Saint John's Eve starts at dusk on the 23rd of June. The sun sets in burning reds and oranges way out over the sea, and the first flames of bonfire night start to wind their way up through the towering pyres all across the landscape around us. Thick columns of dark smoke rise up, creating a chain along the coast. Weâ€™re out on a sand dune as this all starts to kick off, and so have no idea why this is happening. But itâ€™s clearly intentional, so weâ€™re not too worried. Carl does some quick googling, and we both stand there slightly in awe when we learn whatâ€™s happening. The evening was wonderful, and that 10km loop is well worth the distance. As we made our way back into the town we decided to grab a pizza - but just as we reached the take-away, all the lights went out: inside and out. The power was gone everywhere - probably a preventative measure as there were so many fires. We were at the top of a small hill and could see all the villages and communities plunge into darkness. Our dreams of pizza dashed, we went back to our (extremely fancy) tent for the night and ate a fruit cake. Leaving Derrybeg the next morning we stopped into a large supermarket for breakfast, where Carl got a sandwich and I got two eclairs. Iâ€™m still not sure which was the better choice. We both got coffee. The trail leaves this town along the usual routes - very small, twisty lanes that always feel like they donâ€™t see a lot of traffic - except this one see more than the usual. Thankfully the traffic we encounter falls into possibly one of the only forms of â€œgoodâ€� traffic: slow driving tourists and locals in no rush to get anywhere (most likely tired from the night before) who wave as they drift slowly past. The road slowly turns into a unmarked chipped track and then weâ€™re back onto neatly sheep shorn grassy dunes. As we bounced back and forth from the coast we realised that could definitely have camped along any of these sections - and came across many campers ourselves. These things happen. We spend that early afternoon walking along beaches and rocky coastlines, looking out an incredibly blue sea. It was only during our beach walking the previous night that I realised this trail was the first that had beach walking since Iâ€™d fractured my foot 10 months before on the Dingle Way. It was nice to walk without any fear, and felt good to have come full circle from that injury. I didnâ€™t take off my boots for a single step, Iâ€™ve learnt that lesson, but it was very peaceful and enjoyable none the less. We pass through some more coves, back onto a couple of small lanes, and take our lunch break for half an hour at a bench. It mostly involves napping, and a couple of caramel digestive biscuits. Before we set off we have a quick look at the maps and estimate that thereâ€™s only 24km until the end of the trail. And that will mark everything in Donegal done! So I close my eyes, set aside that mornings walk, and imagine that I only have one day of walking left to do, and that I was starting it right then and there. Itâ€™s a new, sunny day, and I only have a short walk to the end. On the next section of trail we come across some amazing, breath-taking cliffs. We want to be making faster time, but theyâ€™re too amazing to rush past, so we take a moment or two. Then itâ€™s into a bog. Thereâ€™s not a lot of waymarking here, and as we reach each Elvis we have to hunt the horizon for the next poll bearing his little yellow smudge. Thereâ€™s no defined trail, so we spend quite a bit of time wandering our way around (or hastily through) marshy green pools. Even though itâ€™s still a drought there are some very wet sections to this bog and both of us end up with soggy feet after an hour or so. Itâ€™s not long after we reach the northern coast again that Carl stops and looks pensively at an Elvis. He wonders if this is the most northerly Elvis. There might be one or two on a local island, but otherwise weâ€™re in agreement - this is probably the most northerly Elvis. At this point we this weâ€™ve seen the most Easterly and Southerly Elvisâ€™ too. We give the top of the post a friendly pat before we move on. We decent and climb through some steep little river ravines. The soil creep on the walls leave a rippling effect, and the land looks like a river frozen under an icing of grass. Leaving the bog once more, weâ€™re back onto dirt paths that turn into small roads. Itâ€™s harder walking on the solid surface in the heat, but the views are good as we pant our way up some small hills. Weâ€™re really pushing ourselves to finish the trail that evening as friends of mine from college happen to be in the area. If we finish that evening we can hang out and grab a lift with them. So we donâ€™t stop or talk much as we work our way through those final few kilometres. Thereâ€™s a petrol station (in a town that I couldnâ€™t pronounce at the time, so have completely forgotten the name of) and we wolf down a couple of 99s. Iâ€™ve been putting on suncream but I can still feel the skin on my face tightening. I belatedly put on my hat that day and hope that my scalp isnâ€™t going to peel again - it had only recently stopped. A peeling scalp is not a good look. There are a couple more roads and such, and then we find ourselves back in Falcarragh. Weâ€™re sweaty messes, and even though we canâ€™t actually tell how bad we smell, we know itâ€™s bad. We grab some lucozade, film an end piece for the video, and wait for my friends to arrive. They bring us to the best pizza place Iâ€™ve ever known in Dunfanaghy, and let us crash on their couch that night. We fall asleep pretty much as soon as weâ€™re in the door. Sometimes I worry weâ€™re rude when we run away to bed, but that day had drained me to my core. They didnâ€™t seem to mind. Side note: Iâ€™m not the best at spelling, and once I learn one way of spelling a word thatâ€™s it. Earagail is the Irish way of spelling Errigal. I didnâ€™t choose to specifically learn the Irish way, itâ€™s what was on the maps, and just became the spelling I learnt. Iâ€™ve just realised that Iâ€™ve used both spellings in this blog post, so apologies if it looks like Iâ€™m talking about two different places! Theyâ€™re all the one majestic place. We also have a drone video from some of the amazing places we visited in Donegal! Itâ€™s the Donegal Drone Mixtape: 300km Rest Day.